Triangulations blogger Sabio Lantz recently put together this rather clever diagram showing how the English language has evolved over the past 3,000 years. And yes, though it first emerged as a West Germanic language spoken in early medieval England, its roots go as far back as the Celts. It was carried by Germanic settlers to various parts of the Netherlands, northwest Germany, and Denmark. One of these Germanic tribes, the Angles, eventually made its way to what is now Britain. At the time, the native population in Roman Britain spoke Common Brittonic, a Celtic language, that had certain Latin features. Lantz's diagram is also fascinating in that it beautifully illustrates how cultural injections influence the evolution of language. For English, this ranged from the Viking and Norman invasions through to the Renaissance mixing and empiric imports, such as Hindi and Arabic. 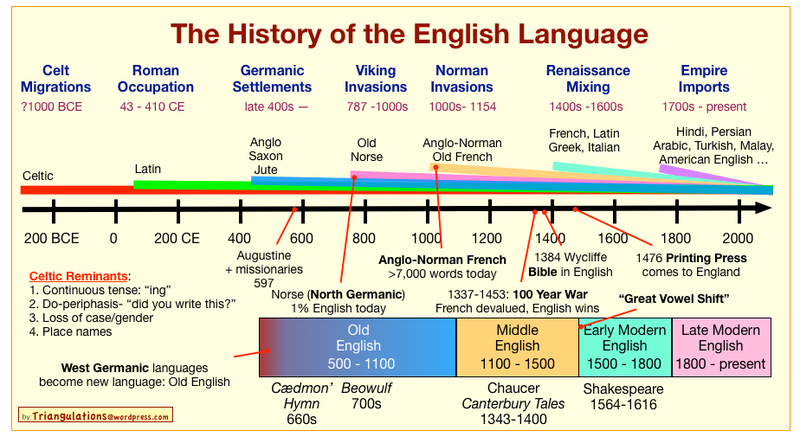 If you find this interesting, be sure to check out this animated history of the English language.